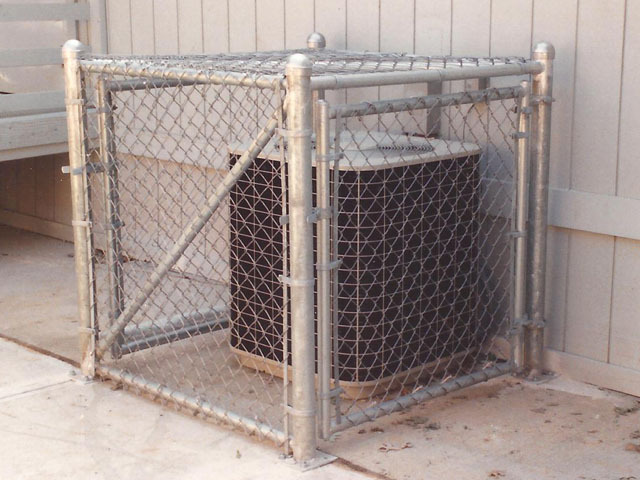 The above pictured security cage for an exterior air conditioning unit is constructed of hot dipped galvanized 2 1/2" American Made steel pipe posts. The posts are attached to the concrete with steel flanges which have been welded to the bottom of the posts. The frame for the cage is hot dipped galvanized 1 3/8" frame. This is a custom welded security cage, and can be constructed in a number of different sizes both for indoor or outdoor use. The chain link fabric used for the cage is a 9 guage aluminized American Made Steel fabric. Don't expose yourself to the ever increasing threat of thieves stripping down your commercial A/C unit! The Elyria Fence Company has been providing security cages for all types of applications since 1932! For the convenience of our customers we provide installations year around, however, be sure to plan ahead on your installation. The spring and summer months are very busy, and this will allow us to accomodate for your school or parks and recreation sports schedule. Contact one of our estimators for a free appointment to discuss your construction and specification requirements. Don't be fooled by our name - Elyria Fence has been pleased to offer our custom security cages for installation in the following Ohio cities since 1932: Akron, Amherst, Ashland, Avon, Avon Lake, Bath, Bay Village, Beachwood, Bedford Heights, Belden, Bellevue, Berea, Berlin Heights, Birmingham, Boston Heights, Bratenahl, Brecksville, Broadview Heights, Brooklyn/Old Brooklyn, Brookpark, Brunswick, Carlisle Township, Castalia, Catawba, Chipewa On The Lake, Cleveland, Cleveland Heights, Columbia Station, Copley, Creston, East Cleveland, Eaton, Elyria, , Fairview Park, Fairlawn, Friendsville, Garfield Heights, Gates Mills, Grafton, Hinckley, Homerville, Huron, Hudson, Independence, Kelly's Island, Kipton, LaGrange, Lakeside Marblehead, Lakewood, LaPorte,Litchfield, Lodi, Lorain, Lyndhurst, Macedonia, Maple Heights, Medina, Milan, Monroeville, New London, New Russia Township, Northfield, North Olmsted, North Ridgeville, North Royalton, Norwalk, Oakwood, Oberlin, Ohio City, Olmsted Falls, Parma, Penfield Township, Peninsula, Pepper Pike, Pittsfield, Polk, Port Clinton, Put-In-Bay, Richfield, , Rittman, Rochester, Rocky River, Sagamore Hills, Sandusky, Seville, Shaker Heights, Sharon Center, Sheffield, Sheffield Lake, Sheffield Township, Sheffield Village, Solon, South Amherst, South , Spencer, Strongsville, Stow, Tremont, University Heights, Valley City, Valley View, Vermilion, Wadsworth, Wakeman, Warrensville Heights, Wellington, Westlake, West Salem, Woodmere.